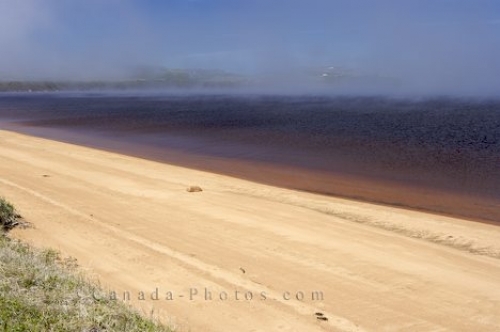 The fog creates a mystical picture over the water and sandy beach at the mouth of the Pinware River in Southern Labrador, Canada. The fog starts to lift over the mouth of the Pinware River in Pinware River Provincial Park in Southern Labrador giving us a glimpse of the rocky coastline adorning the backdrop. The sandy shores are free of any fog as the water ripples near the water's edge making this an ideal time of day to stroll through the sand watching the horizon as it slowly comes into view. The sandy banks at the mouth of the Pinware River in the Pinware River Provincial Park, Pinware, on a foggy morning, along the Labrador Coastal Drive, Highway 510, Strait of Belle Isle, Viking Trail, Trails to the Vikings, Southern Labrador, Labrador, Atlantic Canada, Canada. Picture of the sandy shoreline at the Pinware River Mouth in Southern Labrador with fog still blanketing the rest of the area.